How many times do you hear: I never go to Mass, I’m a good person, but I don’t follow any faith or “religion” but I’m “Spiritual”. The bigger question is, what “Spirit” are you following? If you’re not following Jesus Christ, then you need to ask yourself this question. The reason we are Christian is the fact we follow Jesus Christ. We do what He tells us to do. Especially in regards to “obedience”. 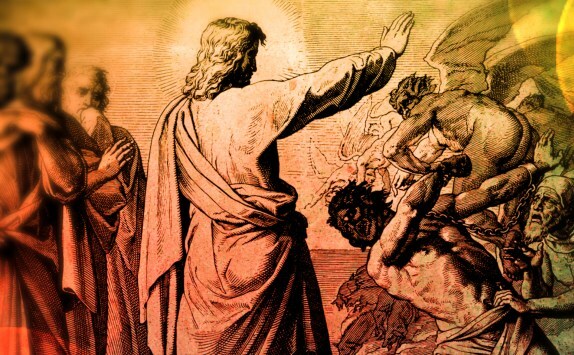 Todays gospel reminds us that the devil, who is also “Spiritual” knows Jesus Christ to be the Son of God. All “Spirits” know Him. The evil ones are the ones who refuse to follow Him. They do everything in their power not to follow Him. They do not believe Him. To “Believe” means to have confidence in the truth, the existence, or the reliability of something, although without absolute proof that one is right in doing so. Thus we “Listen” to what He tells us to do, because we know it to be the correct path. We do it because we love Him. Ask yourself again, what “spirit” am I following if I am not following Jesus Christ? At the end of the gospels, all of them, by the end of our Lords ministry, all the Disciples of Christ, know who He is. “Who do you say that I am?”. When we seek Him, we can find Him. We desire only to stay with Him. In “Communion” with Him. To receive Him and for Him to receive us. To love and serve Him. In all that we do. He makes it known, He is with us, in love. Without a doubt. His presence we encounter in the Holy Eucharist, becomes His presence in us, that we may share Him with all we encounter.